Eating and Reading: D. Ray Pauwels' Veggie Chili and "Who Iced the Snowman?" Though cozy mysteries can and should be read at all times of the year, winter brings with it the perfect weather for curling up inside and reading mysteries by the fire. That same weather also makes it the perfect time of year to fire up the stove and experiment in the kitchen, and Cozy Cat’s cookbook, Cozy Cats Cook: Over 20 Authors Share Recipes, will help you expand your repertoire with enticing recipes from your favorite Cozy Cat authors. The cookbook can be purchased from Amazon. This winter, the Cozy Cat Blog will be publishing four installments of an “Eating and Reading” blog series where recipes from Cozy Cats Cook will be paired with one of Cozy Cat’s mysteries. This week, we’re cooking D. Ray Pauwels’ “No Fire Without Smoke” Veggie Chili sin Carne, a delectable vegetarian chili bursting with rib-sticking flavor. Pauwels’ dish is an easy one-pot meal that goes well when paired with his funny, wintry mystery, Who Iced the Snowman?, available for purchase from Amazon. Below you’ll find the recipe. D. Ray Pauwels enjoying his chili. 1. Chop the vegetables to your preferred level of “chunkiness” (smaller or larger). Set aside in a bowl. 2. Heat the oil in a large pot just below medium heat on a large burner. Add diced onions and crushed garlic, sauté. 3. Add powdered spices, liquid smoke, and cocoa/mole. Stir a few minutes until onions are translucent . 4. Add TVP or tofu (if using). Stir another few minutes to blend with spices. 5. Add all vegetables and the ½ cup of water. Raise heat to medium-high and cook for 5-10 minutes with the lid on, stirring occasionally to prevent burning. 6. Add tamari sauce, tomatoes, corn and beans. 7. Stir well and cover. Bring to a boil and turn head down to low. Let simmer at least a ½ hour, but longer is better. If you prefer a thicker sauce, add a can of tomato paste. If you have a slow cooker, you can transfer the chili to it and keep it warm at low heat. 8. Optional: Serve in shallow bowls and sprinkle cheese on top so it melts. Put a dollop of guacamole in the middle followed by a smaller dollop of sour cream or yoghurt, making a multi-colored target. Dash a bit of hot sauce in the very center for a dramatic bull’s eye and garnish with red onion. *This recipe goes great with some zucchini bread on the side, a favorite of the Easter Bunny in Who Iced the Snowman?. 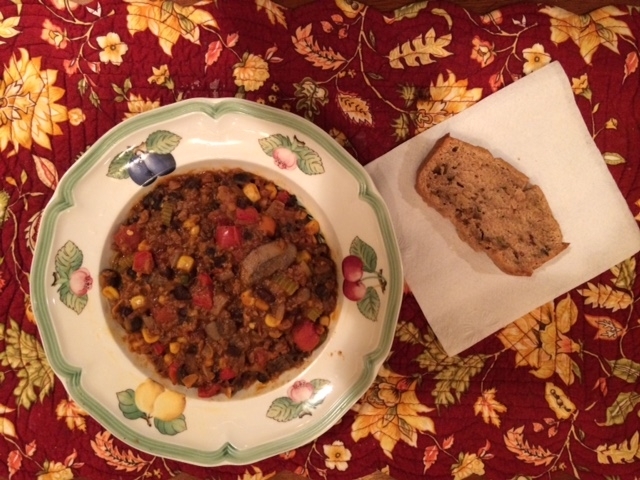 The finished veggie chili with a slice of homemade zucchini bread. Stay tuned for next week’s post, where we’ll be exploring a sweet recipe paired with a fashionably cozy mystery. Eating and Reading: Barbara Jean Coast's Caramel Apple Pecan Scones and "Strangled in Silk"